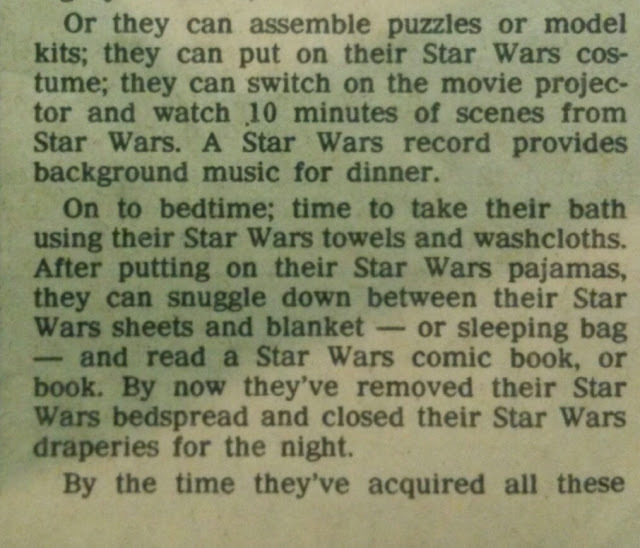 Do you remember the early days of Star Wars merchandising? Many of us were too young to have clear memories. So ephemera such as old ads and newspaper stories are vital in helping us determine what hit store shelves and when. 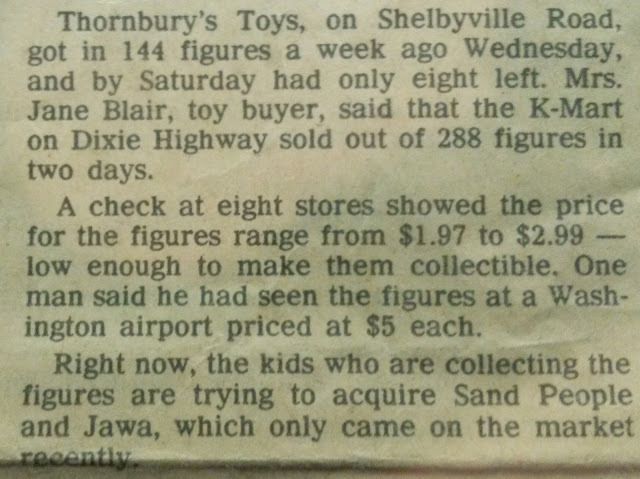 In this post, guest blogger Kevin Lentz gives us a peak at the early days of Star Wars mania in Louisville, Kentucky, where, in 1978, an action figure would run you as much as five bucks -- if you were silly enough to buy it at the airport. 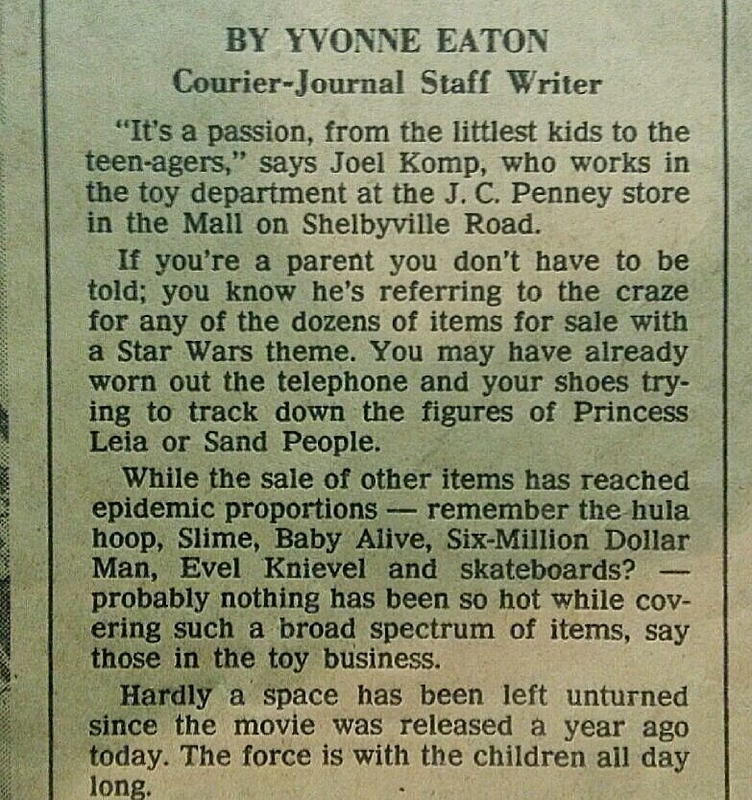 Mike Heicken, a local friend and member of the Kentucky Star Wars Collectors Club, recently posted this Louisville Courier-Journal clipping from May 25, 1978, one year to the day after the cinematic debut of Star Wars. Mike was 9 in 1978, and remembers asking his grandmother if he could save the article, and has kept it since. 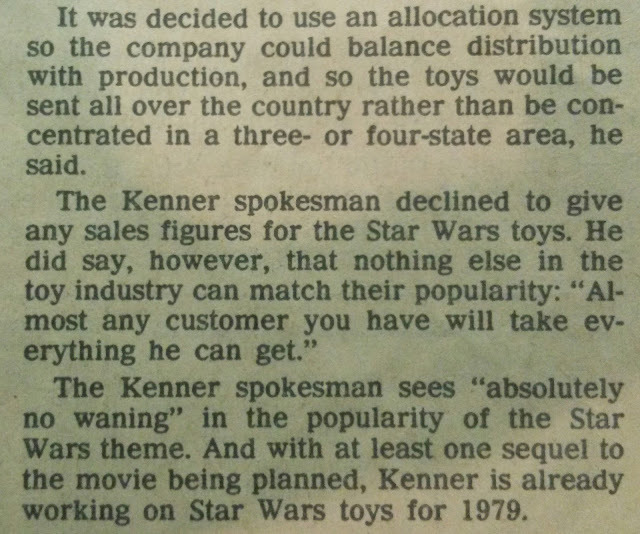 We've had plenty of reporting on the Star Wars merchandise phenomenon in recent years, from the surface-level episode of The Toys That Made Us to the in-depth work done by Brian Stillman's Plastic Galaxy, not to mention the minutiae documented by collectors, publicly and privately, about the employees and internal workings of Kenner. Second, the writer, Yvonne Eaton, does something easy for a contemporaneous writer and something I haven't seen from more recent documentarians -- she interviews store clerks! 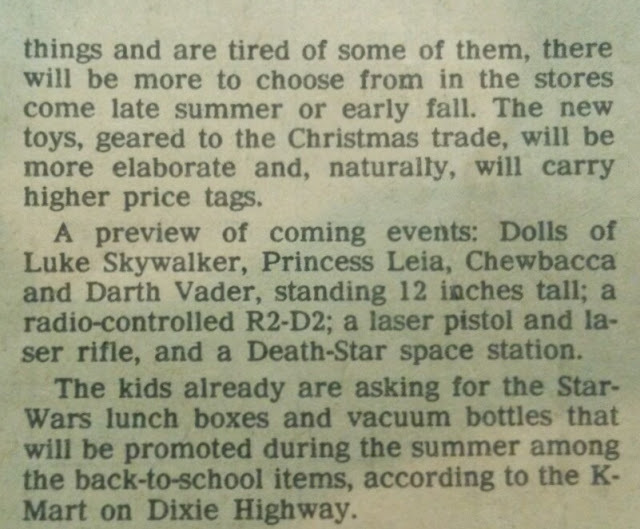 Eaton also does a nice job of understanding and reporting the breadth of 1978 Star Wars fever (one misspelling of "Vadar" notwithstanding). 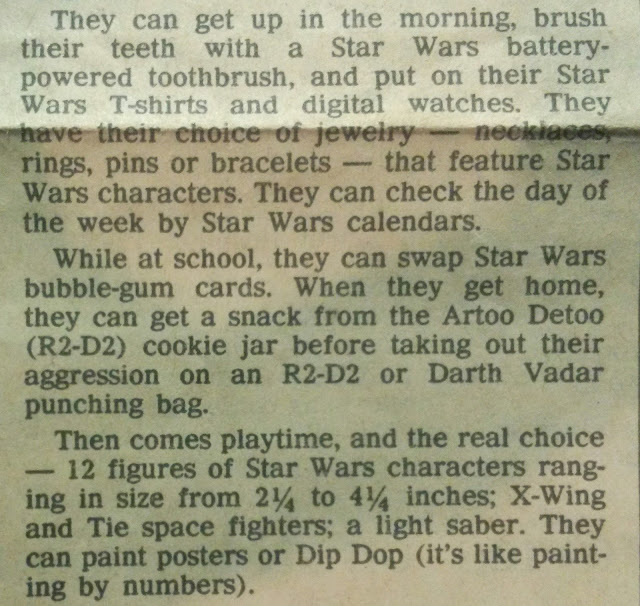 Early in the article, Eaton rattles through a litany of Star Wars products that a kid might experience through the day. Everybody's favorite non-figure thing is likely to be listed -- yes, she mentions the Star Wars album playing "background music for dinner." Through the aforementioned interviews with local clerks, as well as quotes from distributor Dave Glick, though, she moves the reader to the main course -- the action figure toys. 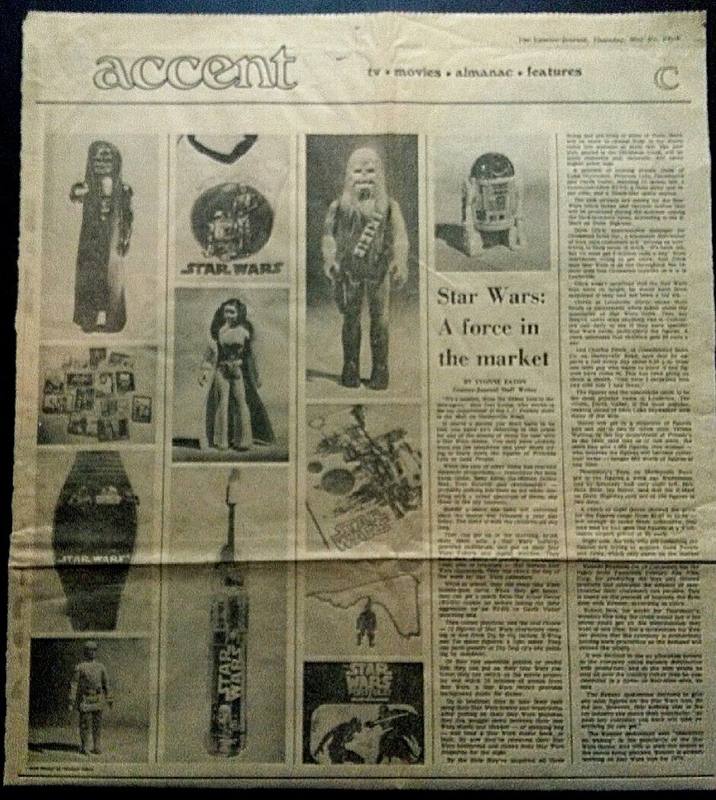 She provides some fascinating information and anecdotes in these sections -- the clerk who takes a regular 5:30 call from a kid asking if any new figures are in, the popularity of Vader and Luke figures, stores selling through hundreds of figures in days, the exorbitant airport price of $5 a figure, and kids hunting the newest figures (Jawa and Sand People). Apparently, Death Squad Commander, also new, did not rate much attention. 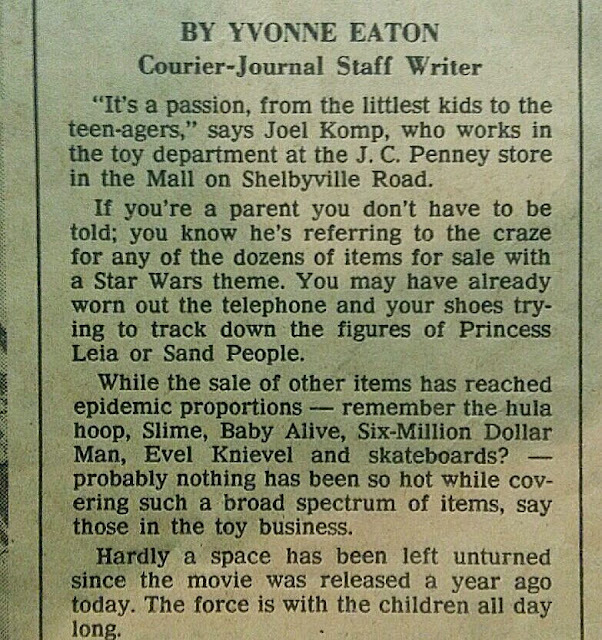 Eaton notes that the J.C. Penney store, as of May 1978, had sold through 4,000 figures! Remember, that's with action figures not hitting stores at all until around March of that year. Eaton also notes, with journalistic detachment, a woman having spent $60 on figures thinking they might someday become "collectors' items." Anyone want to do the math to figure out the average value today of 30 12-Backs? 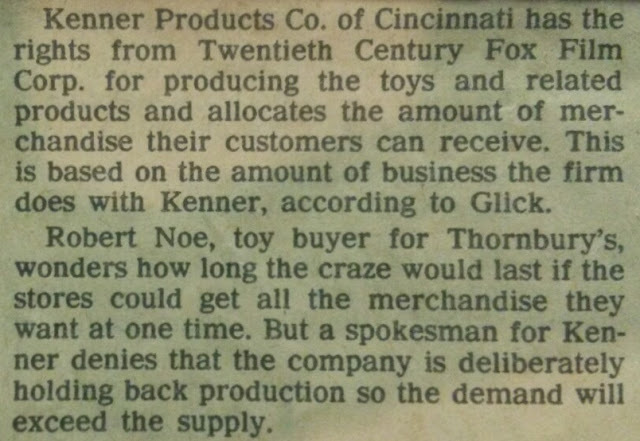 The article closes with information from an unnamed Kenner spokesman assuring everyone that Kenner was not inflating demand with intentionally scarce supply and was working ahead on more merchandise for 1979. 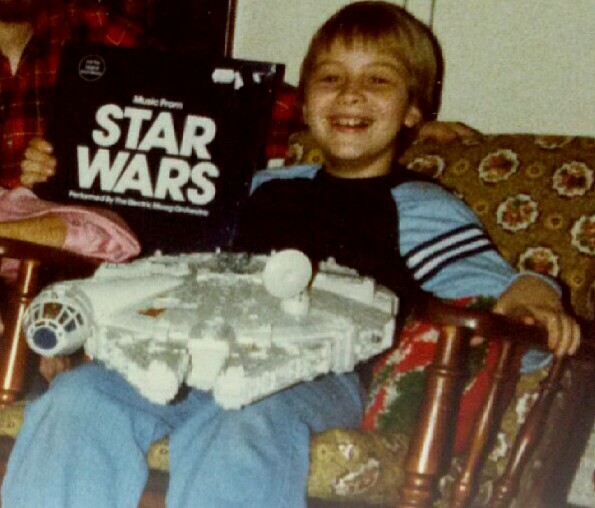 I'm a little younger than my friend Mike -- I was only four in 1978 and wasn't shopping yet for Star Wars toys. Like many of us, I've entertained the fantasy of building a time machine, flying back to 1978 with a suitcase of vintage money, and coming back with a suitcase full of 12-Backs. Before reading this article, I didn't realize there was such a scramble to find them on the shelf -- I imagined just being able to walk into a store, plop down $50, and walk out with a case. It's good to know that, once I get my time machine built, I will need to factor in some patience and perseverance. Fantasy aside, this article makes for a nice time machine in and of itself. Thanks to Mike for sharing! Great article. 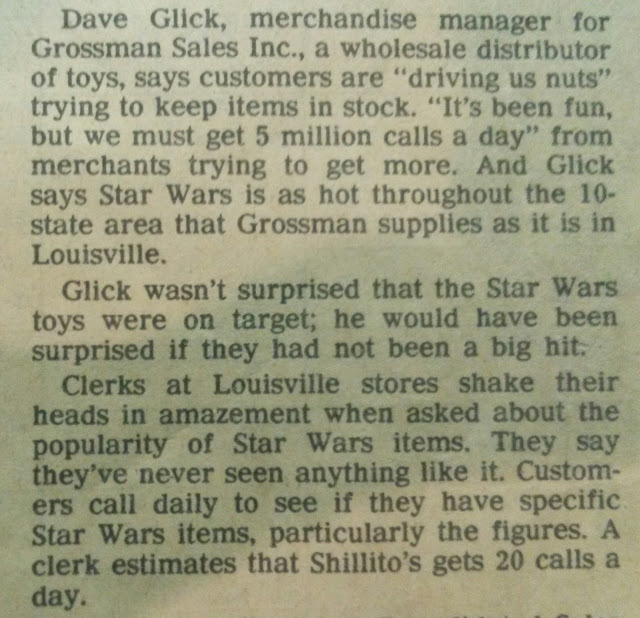 Why am I not in this Kentucky Star Wars Collectors Club, though?